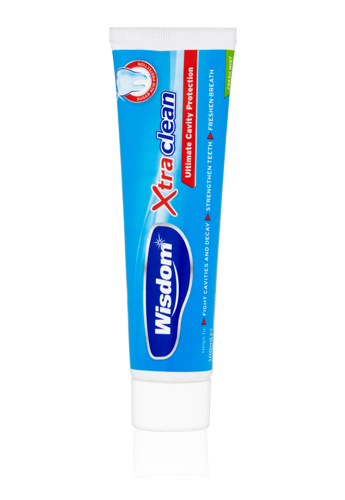 NEW Wisdom Xtra Clean Ultimate Cavity Protection toothpaste contains the optimum amount of fluoride to help provide protection from sugar acids, strengthen teeth, fight cavities and decay. 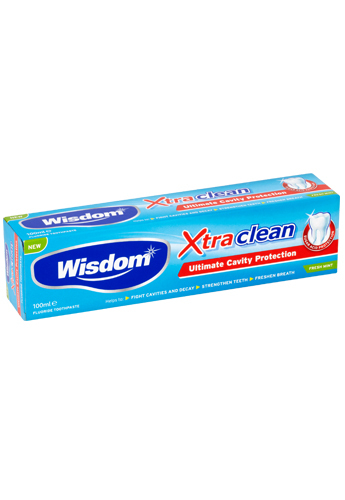 Use with a Wisdom Xtra Clean brush for great all round cleaning. Ingredients: Aqua, Hydrated Silica, Sorbitol, Sodium Lauryl Sulfate, Cellulose Gum, Sodium Benzoate, Sodium Fluoride, Aroma, Sodium Saccharin, Menthol, 2-Bromo-2Nitropropane-1, 3-Diol, Limonene, Cl 77891. Children of 6 years and younger: Use a pea size amount for supervised brushing to minimise swallowing. 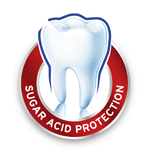 In case of intake of fluoride from other sources consult a doctor or dentist.